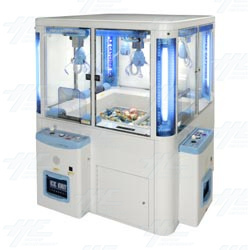 We currently have multiple units of the latest Japanese crane machine Triple Catcher Ice available for sale. Triple Catcher Ice is an innovative crane machine manufactured by Atlus which is designed to contain ice cream and other frozen prizes. It uses the latest freezing technology to maintain a temperature of -25C to ensure that the ice cream remains solid enough to avoid harm from play. Any type of frozen product is suitable for use in the machine. If you would like to put other products into the unit, the freezer can be turned off, allowing the machine to act just like a normal crane. The machine can be played by four people at once, with four separate areas where the prizes are held, making it a great drawcard for any location. For more information about the machine Click Here or contact one of our sales staff.